You might decide that you want to do an exercise in my Self-Therapy book or you might want to do an IFS session on yourself, but you don’t follow through. If you are stuck in this way, it would be helpful to explore what is going on inside you. Why might you want to do something and then not carry through? 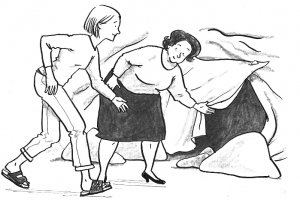 Often this happens because a hidden protector doesn’t really want to do the exercise or session. In other words, even though a part of you has decided that working on yourself would be beneficial, another part of you is balking. This might be a protector that is afraid that if you follow through with an exercise, you will encounter strong emotions that you can’t handle. Or it might be a protector that doesn’t think you will benefit from this work and so doesn’t want to bother. This avoidant protector is clearly in control (since you aren’t doing the exercises), even though it may be unconscious. The best way to handle this situation is to commit to doing a session in which you work with this avoidant protector. In this session, check inside for a felt sense of not wanting to do the exercises. You may even feel resistant to the session you are engaged in right now. You might want to get up and leave, or you might tell yourself that you don’t have time, or you might feel generally uncomfortable. Tune in to that feeling of resistance. It might feel like stubbornness or annoyance or defiance. You might sense apathy or anxiety. Whatever it is, this feeling will give you access to the avoidant part. Then continue through the IFS steps to get to know this part. See what you can discover about why this part doesn’t want you to do the work and what it is afraid would happen if it allowed you to. Then see if you can reassure this protector that its fears won’t come true, just like you might reassure a concerned part. For example, you might explain that you aren’t going to dive into overwhelmingly painful emotions, and you won’t allow any dangerous parts to take over. Assure it that you will stay in Self while you become acquainted with your parts. For this reassurance to be effective, you may need to develop a trusting relationship with the avoidant protector. However, even one short session with an avoidant protector can make a big difference in your willingness to do the work. If you do such a session but your avoidance doesn’t change, it is possible that there is more than one avoidant protector. Do another session in which you check for others and work with them. Since you are avoiding doing sessions, it may be difficult to do even this session on the avoidant protector. You might keep making excuses instead of doing it. One way to make this session happen is to schedule it with a partner. If someone else is counting on you to be there, it makes it harder to avoid. Or you could do this session with an IFS therapist, who might help you get at deeper issues behind your avoidance. Let’s assume that you have been getting to know a protector and developing a trusting relationship with it. Once you are aware of the exile that it is protecting, ask permission from the protector to get to know this child part. You may receive an explicit yes or no. Or you may just sense that your way to the exile is clear or that it is blocked. Or the exile may suddenly emerge into consciousness, indicating that you have permission. Once you get permission, it may be a good idea to check if there are any other protectors that object to your contacting this exile so you can get their permission, too. If you don’t get permission, you ask the protector what it is afraid would happen if it gave permission, and then reassure it about its fears. This step highlights a major advantage of using IFS—its cooperative approach. Let’s consider a situation where your heart is contracted to keep you from feeling the pain of being rejected by a lover. In many forms of therapy, you would focus on the contraction and try to get your heart to open so you could feel the underlying hurt and thereby heal it. But this means fighting against the part of yourself that is contracted, which is a protector. This part believes that it must keep contracted so you don’t feel this intense pain. Turning it into an adversary usually backfires. The more you try to get past the contraction, the more it fights you. And if you do manage to break through this protector, you may accomplish a dramatic, cathartic healing, but the contracted protector is likely to reconstitute itself soon afterward because you didn’t respect it and get its buy-in. There is a powerful advantage to understanding that there are two parts involved. Though the protector is keeping you from the pain, it may not realize that there is an exile that is already feeling the pain. It may think it is actually preventing the pain from existing at all rather than preventing you from feeling what the exile is already experiencing. Using IFS, you don’t try to break through the protection; you don’t even ask the contraction to let go. Instead, you make it clear to the protector that the exile is already in pain, and you just ask permission to work with the exile so you can relieve it of the pain that exists. This way the protector feels you are trying to help rather than to cause pain, so it is much more likely to agree. Let’s assume that you are working with a protector and you have gotten to know it, discovered its positive intent, and developed a trusting relationship with it. Your next step will be to get the protector’s permission to work with the exile it is protecting. But first you must recognize which exile the protector is guarding. Sometimes the emotions of the exile come up while you are working with the protector. For example, you are talking with a protector that feels it must always be right. As you are getting to know it, you begin to feel a hurt feeling in your chest. This is probably coming from the exile that is being protected. Sometimes you hear the voice of the exile. For example, while you are talking with a protector, you hear a voice that says, “I feel so alone and left out.” That doesn’t sound like the protector, so it is probably the exile. Sometimes you get an image of the exile behind or below the image of the protector, or you see their relationship in some other way. For example, suppose you have a protector that keeps you overly busy so you don’t feel the pain of an exile who is a lost little girl in the dark. You might visualize the little girl partially hidden behind the busy protector. You have asked the protector what it is afraid would happen if it didn’t perform its role. This answer frequently points toward the exile because the reason the protector is there is to guard the exile. 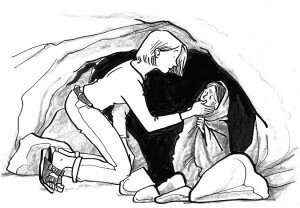 For example, if the protector says it is afraid you will feel hurt or scared or lonely, it is probably protecting an exile that feels one of those emotions. If the protector says it is afraid that you will be judged or humiliated, it is probably protecting an exile that was judged or humiliated in the past. You can ask the protector to show you the exile it is protecting. If you have built enough mutual trust, it will usually do that. When you become aware of how an Inner Critic Part is tearing you down, you may want to ignore it, argue with it, or banish it. However, none of these approaches are effective for very long. The Inner Critic will keep popping up and attacking you. You usually can’t win an argument with a Critic. And they can’t be banished for long. The IFS approach is much more effective. An Inner Critic part is actually an IFS protector, which means that it is trying to help you by protecting you from pain or harm. A Critic usually does this in a hurtful and distorted way, so it doesn’t really succeed in helping you, but nevertheless its heart is in the right place—it is trying to protect you. This means that you can use the IFS approach to get to know each Inner Critic and develop a trusting relationship with it, which lays the groundwork for transforming it. If an Inner Critic seems very powerful and threatening, you may be frightened of it or devastated by its attacks. However, once you get to know a Critic using IFS, your view of it may change radically. You may realize that it is actually a frightened child part that is puffing itself up to intimidate you, but it really can’t hurt you once you see through its facade. Let’s look an example. Sarah was very frightened of her Inner Critic. It screamed and yelled at her and crushed her with its powerful attacks. It told her that she was worthless and would never amount to anything. 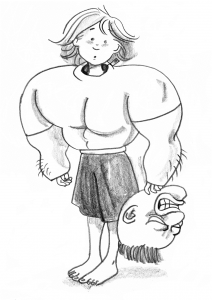 She called her Critic the Attacker and visualized it as a huge monster with great muscles and a loud voice that was attacking her physically. Attacking was a game in our family. They were all doing it, so I had to do it, too, and I had to be good at it. If they were going to do that to me, then I wanted to do it to myself first so they couldn’t do it to me worse. This gave me the power of not being hurt by them. I was trying to protect this child part (which Sarah called the Scared Kid) from being hurt by them and from feeling all that hate and criticism from the family. That was too painful, so if I hurt the Scared Kid instead, it wasn’t so bad because I was the one hurting her—not the people she really wanted love from. This information from the Attacker allowed Sarah to begin connecting with it and gave her a different image of it. When Sarah and I heard this sentiment, we both had tears in our eyes. The Attacker was actually a child part that was intent on protecting the Scared Kid from pain. This is so different from the way we usually think of our Critics. This understanding was moving for Sarah (as well as for me), and it made it easy for her to feel compassion and caring for the Attacker. She saw that the real Attacker had been revealed, like the little man behind the curtain in The Wizard of Oz. And Sarah’s image of the Attacker changed. Now she saw it as a frightened girl who was doing her best to act tough to prevent a terrible tragedy. Do you know when you are talking to an Exile? A frequent occurrence that can sidetrack your IFS work is when the part you are talking to changes without your realizing it. You are asking a part questions and receiving its answers, but at some point the answers start to come from a different part. It is important to detect this when it happens. The usual way this happens is that you are working with a protector and you start hearing from the exile that is being protected. However, you don’t realize that this has happened; you think you are still talking to the protector. Since the protector and exile are closely linked, this is not surprising. However, you must learn to recognize when this occurs because we work with protectors in a different way than with exiles in IFS. You will recognize an exile because it has a painful emotion such as shame, fear, sadness, or hurt. It is important to have the protector’s permission before exploring the exile, so if an exile pops up, ask it to wait until you have finished with the protector. Here is an example from a session. This demonstrates a protector switching to an exile without the person realizing it. Christine has identified a protector that doesn’t want to see or know certain things. She is getting to know it. Let’s take up the session at that point. Jay: Invite that part to tell you or show you more about what it feels. Christine: It says that it feels sleepy and dull. I can sense that it goes blank. It says, “I want to go to sleep. I don’t want to be awake or conscious.” Sometimes it can’t answer people’s questions. J: Mm hmm. Ask the part what its name is or what it would like to be called. C: I get the word Confuser. J: Okay. Ask it what it is trying to accomplish by being sleepy and confused. C: It says, “I don’t want to see something. I don’t want to know something.” This part has to just make unclarity and confusion, blandness. It wants to make sure that I don’t know what is going on. J: It creates confusion to protect you from whatever is going on . . . What else does this part want you to know about itself? C: (pause) Well, it’s showing me a demonstration of its panic state, which has something to do with being alone. Here is where the switch happens. Christine is now hearing from the exile. The Confuser produces confusion and not-knowing, while the exile is terrified. So I ask about this in order to clarify what has happened. J: I’m a little confused. I thought this was the part that didn’t want to see anything. C: It’s two sides of the same coin. The one that doesn’t want to see, doesn’t want to see because it’s terrified. This is true, but the part that actually feels the terror is the exile, so I focus her back on the protector, whose job is to avoid the terror. J: I suspect that the one who is terrified is actually a different part. Ask the terrified part if it would be willing to wait a bit, and let’s focus on the Confuser, if that’s Okay. This switch from protector to exile often happens because the exile desperately wants to be heard. It senses that you are approaching and wants out of exile, so it rushes the gate. When you detect that this has happened, ask the exile to wait until you have gotten to know the protector and received its permission to proceed. So the exile doesn’t feel ignored, let it know that you want to get to know it, but ask it to wait while you continue with the protector. The IFS Exiles Course is the second of my IFS Courses. how to unburden the pain and negative beliefs of exiles so they are transformed. This enables you to do a complete IFS session with yourself or a partner. You learn how to facilitate a partner who is working on themselves. Prerequisite: IFS Basic Course or equivalent. Contact me if you aren’t sure whether you qualify. I found this post on a forum on the web, and then I responded to it. I have included both. 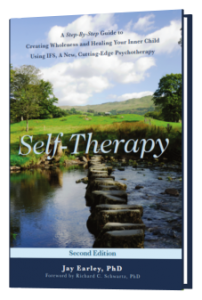 The forum post: So, I’ve been reading Self-Therapy by Jay Earley, PHd over the last week or so. I finally finished it last night. I have been both intrigued and skeptical with the work. Anyway, after I laid down for bed (I never go right to sleep) I decided to do my first session. I thought about a phone call I have been wanting to make for a couple weeks, but have been putting off, so I went to work on a procrastinating part. It turned out that part was protecting a Panicked part. When I asked the Panicked part to show me a memory that it was carrying, I was amazed at how at superfast speed I was given the memory of my Father having a heart attack nearly 15 years ago. He recovered well and it wasn’t something I’ve thought much about since. But, I then remembered details about that occassion that surpass my usual recall for events. I then went on to unburden the Panicked part and the procrastinating protector. Yes, it does seem like it was all happening very fast in one sessions time. So, a little bit ago I’m recalling the session I did and this memory that I was givn and how incredible that seemed, but thinking to myself it didn’t really work overall. I still slept late this morning. I decide to post this about the memory and as I start to type it hits me- I MADE THAT STUPID CALL about an hour ago! That seems significant! I’ll definitely have to work at this IFS stuff some more anyway. My response: I’m very impressed with your ability to read my book and then immediately do a session on yourself, and follow it all the way through to unburdening. That is fabulous! And it’s great that you got a noticeable change in the procrastination issue you started with. Congrats! In order to reconnect with the part you worked with, you probably need to remember how you accessed it–through an image, body sensation, emotion, etc. Then you use that to bring it back. You obviously have a pretty good memory of the session. If that doesn’t work, it may mean that another protector is getting in your way. At any given moment, you are either in Self or you blended with a part—a protector or exile. When you are judging yourself, you are blended with an Inner Critic part. When you are feeling bad about yourself, you are blended with a Criticized Child part. In fact, you are often blended with both the Critic and the Criticized Child at the same time. You can only work successfully with an Inner Critic if you aren’t blended with it or the Criticized Child. When you unblend from a Critic, it doesn’t mean that the self-judgment disappears or you stop feeling bad about yourself. It means that you aren’t completely taken over by these feelings. You have some space inside that is separate from them. You don’t fully buy into the idea that you are inadequate. You can see that this is just a part of you that is attacking you rather than believing it is the truth about you. For example, if your Inner Critic says that you are a loser and will never find love in your life, you recognize that this is simply an attack from this part of you. It isn’t the truth. Though you may still feel sad or ashamed, when you are unblended with the Criticized Child, you aren’t dominate by these feelings. You have a place in you (Self) that is feeling solid and OK. From this place you can view these feelings and understand these attacks and work with them. You may feel hurt to hear this message that you are a loser, and you may feel some hopelessness about your love life, but that isn’t all you feel. You reside in a place that is deeper than those emotions, a place of calmness and curiosity. This is not the final solution to your Inner Critic problem. It is just a preliminary step that gives you enough space to deal with the problem.